Story originally appeared on MarylandThoroughbred.com (Maryland Horse Breeders Association). Breeder: K. T. Leatherbury Assoc. Inc.
On a Wednesday afternoon in February, Julian Pimentel picked up the phone and was immediately asked to recall a moment that had happened some 1,731 days prior. The question was about a horse and a race – a maiden claiming race, at that – just one of 8,691 races Pimentel had ridden to that moment. Yet, without hesitation, the 35-year-old jockey from Colombia remembered where he was, who his mount was and what unfolded on May 8, 2010. The location was Pimlico Race Course and the mount was a then-unknown 4-year-old gelding making his racing debut. The gelding’s name was Ben’s Cat. What stood out most to Pimentel, in retrospect, was that nothing really stood out about Ben’s Cat. 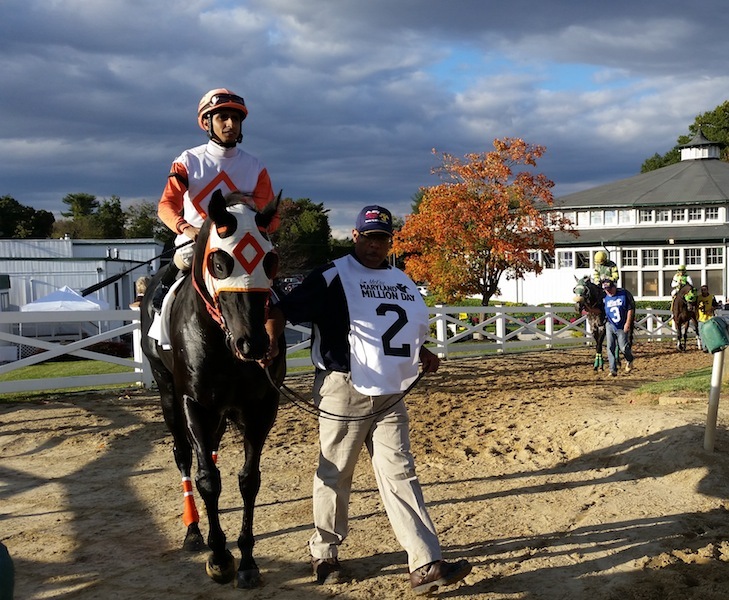 The gelding, bred and trained by King Leatherbury and owned by the trainer’s The Jim Stable, hadn’t made a significant impression on the betting public either, and was sent off at nearly 5-1. Even after his easy maiden victory, Ben’s Cat returned a month later at Delaware Park for a $25,000 tag, up slightly from the $20,000 he’d been available for in his debut. With Pimentel aboard, the Maryland-bred son of Parker’s Storm Cat made it two in a row. Next out, Ben’s Cat won again, and then again. Despite that, Pimentel opted off when Ben’s Cat made his stakes debut in the 2010 Mister Diz. Pimentel already had a commitment in the race to a Mike Trombetta-trained colt Not for Silver. Pimentel and his charge finished fourth while Ben’s Cat won from off the pace with Rosemary Homeister Jr. Ben’s Cat went on to win the Mister Diz four more times, including the 2014 edition that kicked off his Maryland-bred Horse of the Year and champion older male, turf horse and sprinter campaign. The awards bring Ben’s Cat’s career haul to 17 state championships and four Horse of the Year titles. Ben’s Cat was a rising star in the sprint division by late 2010 and certainly a desirable mount. Pimentel was happy to be back aboard for his next two stakes wins. Together, they took the Maryland Million Turf Sprint and Find Handicaps, and then followed up with another allowance score that moved Ben’s Cat’s record to 8-for-8. Pimentel grew increasingly fond of the gelding in subsequent months. Ben’s Cat became more manageable in the morning, but he did start something he hadn’t done before – losing. After a fifth in the 1-mile Native Dancer Stakes in 2011 was followed by a fourth in the 7-furlong General George Handicap-G2, Pimentel decided to express his thoughts on why Ben’s Cat lost his winning kick. Pimentel recalls the incident with a light-hearted laugh, implying that it was funny in a frustrating kind of way. Deep down, it was more frustrating than funny. It especially stung to watch as other riders, primarily Jeremy Rose, rode Ben’s Cat for the next year and a half. Time cooled any tensions in the separation of Pimentel from Ben’s Cat. When the jockey was given an opportunity to ride Ben’s Cat for the first of what would be three straight wins in the Parx Dash Handicap-G3, it was like being reunited with a lost love. Pimentel’s affection for Ben’s Cat still runs as deep, if not deeper, as it did then. For 22 consecutive races, Pimentel has been aboard Ben’s Cat. Over that stretch, they won 13 stakes races while racking up hundreds of thousands of dollars in purse money. Ben’s Cat’s earnings stand at $2,320,990. A healthy chunk – $458,350 – was earned in 2014 as an 8-year-old. When asked whether he had a favorite memory or if he could identify one race that stood, Pimentel said he couldn’t. To him, the entire body of Ben’s Cat’s work – from that maiden breaker to his third consecutive win in the Fabulous Strike Handicap to finish 2014 – is simply astounding. And Pimentel is just grateful he’s been along for most of the ride.